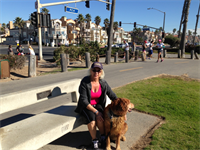 Directory > Providers > Alternative Medicine > Acupuncturist > CA > Huntington Beach > Robin Roemer Brown, L.Ac.,Ph.D. I am a graduate of University of California, Santa Barbara and also South Baylo University. I then studied Advanced Acupuncture Orthopedics and studied in China. I studied for Doctor of Naturology and I have a Ph.D.in the area of Spirituality. I have run 10 Marathons and have been a competitive Triathlete a long time ago. I had to learn to walk in balance myself for the last 35 years and it has been a wonderful journey which has granted me a great deal of compassion and understanding. I have been able to assist people with a myriad of odd ailments and we succeed together. I believe there is a solution for each and every one of us. I use applied clinical nutrition. I am unique because I was born in Long Beach, CA which makes me a local. I have helped people get much stronger in body mind and spirit and believe each of us deserves personal care on our path to wellness and personal medicine means just that. Wellness. Come on in and have some tea.